In the morning before work, caffeine is an absolute must. Even with a full night's sleep, I find a little caffeine goes a long way in perking up the spirit and making my day a little bit happier! My sister got me started on green tea and we worked our way into matcha. 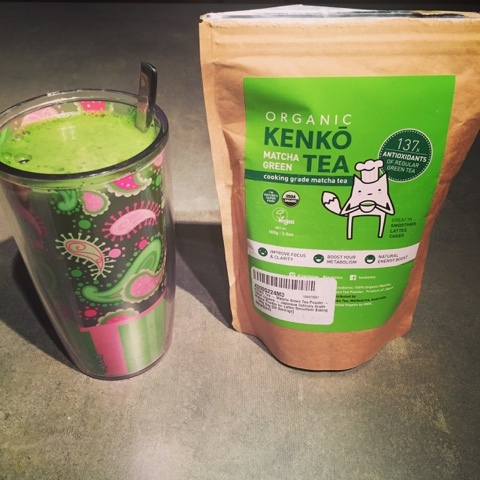 Matcha is ground green tea leaves and boy, do they pack a punch! It's not a super labor intensive process but you must be prepared for the bitter flavor of unsweetened matcha. I love making matcha with a small hand blender I got from IKEA and some agave nectar. Another good way to enjoy it is with some Amazing Grass Superfood powder mixed in! Anyway you dice it, this stuff is not as strong as coffee but it makes you alert without the jittery feeling of too much caffeine. In my book, that's a total win.